Accident Scene Management Skills Improve Outcomes | Hupy and Abraham, S.C. Working as an accident investigator for over 24 years, I have seen proper scene management as well as costly mistakes. As winter approaches, it's time to consider enrolling in an Accident Scene Management class (ASM). ASM has trained over 25,000 people what to do at the scene of a crash before professional help arrives. 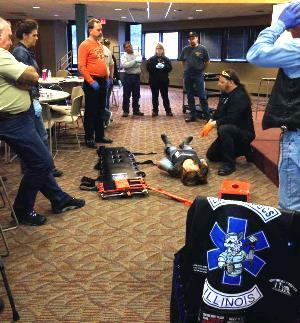 This training includes making the scene safe and preventing further injuries, and safe-guarding the rescuers. Students learn the proper way to contact emergency dispatchers with information about the crash as well as providing life-sustaining care to the injured. There is also a section on preserving evidence and proper techniques of photographing the scene. The emphasis of the class is providing proper care to the injured, and how to interact with emergency medical responders if they ask for your assistance. ASM has 160 instructors worldwide and has classes in 32 states as well as Australia, New Zealand, South Africa and the Phillipines.